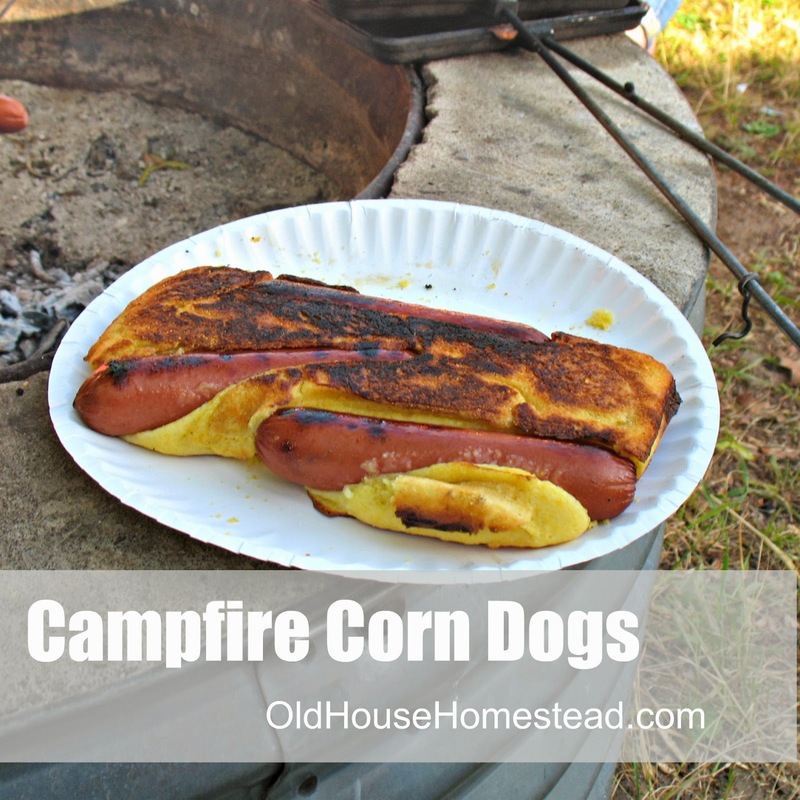 OLD HOUSE HOMESTEAD: Corn Dogs on the Fire! Corn Dogs on the Fire! I have another fun campfire recipe to share with you! We tried this while we were camping and it was pretty tasty! This is from the Gooseberry Patch Grilling and Campfire Cooking book that I'm giving away HERE. For this recipe you'll need a pie iron. A rectangular/square one is best! We had a little sticking problem at first so we added a bit more butter to the pie iron the second time around. Ketchup, mustard ... whatever you like on your corn dogs. In a bowl, stir together muffin mix, milk and egg until moistened (we added a tablespoon of melted butter). 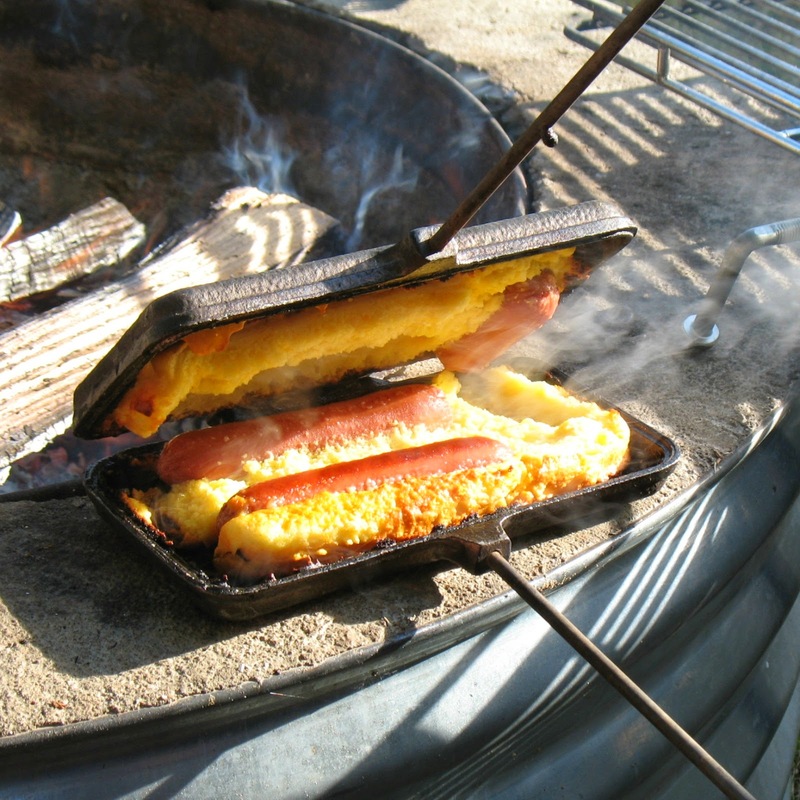 Place two hot dogs inside a well-greased pie iron (more butter is better!). Add enough batter to fill bottom of pie iron. Close pie iron; turn over and cook over campfire for 3 minutes (give or take a minute). Turn over; cook for another 3 minutes (again, give or take a minute), or until cornbread is set. Repeat with remaining ingredients. Slice between hot dogs; serve with ketchup and mustard. Enjoy!